"In its way "Pop" art is always changing - like "Pop" artists. It's a natural move of things like pop music and even Popeye the sailor man." - Ringo 2005 "
When Ringo was born on July 7, 1940 in Liverpool, his parents, Richard Starkey and Elsie Gleave decided that Ringo should be named after his father. But his parents’ marriage did not last and Ringo and his mother had to move to a smaller house because of financial constraints. His mother remarried a few years later and Harry Graves became Ringo’s step father. It was Harry who bought Ringo his first drum set. In 1959, Ringo officially joined a band called Rory Storm and the Raving Texans. It was around this time that Ringo received his nick name. Since Ringo used to wear many rings on his fingers, he was urged to adapt the moniker “Ringo”; it placed a western, cowboy spin to the word ring. He also decided to shorten his last name Starkey to Starr so that his drum solo act could be billed as “Starr” time. And thus the name Ringo Starr was born. Later the group decided to change their name to Rory Storm and The Hurricanes. In 1960, the group went over to Hamburg to play at the Kaiserkeller and this was where Ringo became acquainted with The Beatles. In August of 1962, Ringo was asked to join The Beatles and he jumped at the opportunity. Five years later, Ringo married his long time girlfriend Maureen Cox and they had three children together. When The Beatles finally split up in 1970, Ringo already had two solo albums under his belt; Beaucoups of Blues and Sentimental Journey. He went on to release a string of singles that were hits. Ringo also decided to act in the movies and dabbled in producing them as well. The younger generation may know him as the magical character, Mr. Conductor in the PBS hit series Thomas The Tank Engine and Friends. He also appeared in made for tv movies like Alice in Wonderland. Ringo performed on the drums on a few songs for Paul McCartney’s ‘Pipes of Peace’ and George Harrison’s ‘Cloud Nine’ albums. 1989 saw the birth of Ringo’s first solo concert tour when he formed his own group called Ringo Starr and His All Starr Band; Ringo and The All Starr live music album was released the next year. This marked the first in a series of concert tours. The members in his All Starr Band would change from one world tour to another world tour. 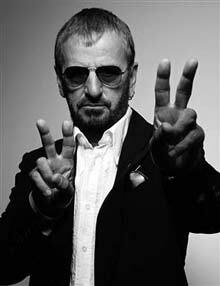 Currently Ringo is performing in his 6th world concert tour in the United States of America with his All Starr Band. The band members for this round are Jack Bruce, Eric Carmen, Dave Edmund, Simon Kirk and Mark Rivera. Beatles fans attending his All Starr concert should be forewarned that the format for his concert is that Ringo performs a few of his own songs, and each of the band member takes a few turns singing and performing their own hits. Those who attend the concert hoping for renditions of Beatles songs may get disappointed, at the most a Beatles fan can expect is one Beatles song from Ringo.